Speaker KR Ramesh Kumar worked out of this office for two weeks. 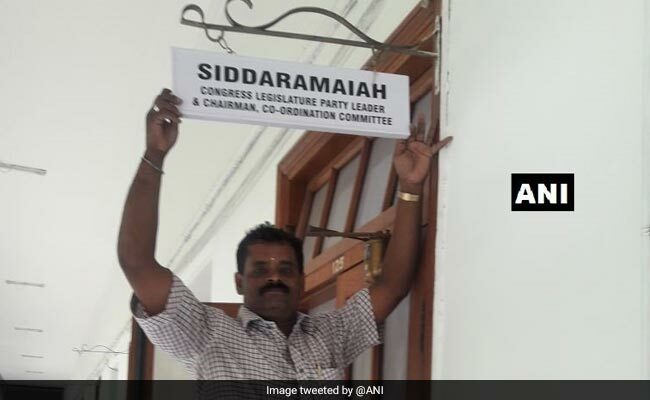 Bengaluru: Former Karnataka Chief Minister Siddaramaiah, who has no constitutional post in the new state government, has been allotted the swanky office of former speaker in Vidhana Soudha in Bengaluru. Speaker KR Ramesh Kumar -- who took over from former Speaker KB Koliwad and worked out of the office on the first floor of the complex for two weeks -- cleared the space for Siddaramaiah. The 69-year-old former chief minister is the leader of the Congress Legislative Party (CLP) and the chairman of the JDS-Congress government coordination committee. He was unanimously elected as the leader of the CLP last month. The swanky new office has high-end wood furniture, including luxurious sofas, chairs, LED TV and other comforts. Mr Koliwad had renovated his office last year at a cost of Rs 68 lakh and the single-room office was expanded into two, reports said. The decision to embellish his office was criticised by the BJP which raked up farmer suicides in the state to draw a contrast. But Mr Koliwad cited severe space crunch in his defence and said it was difficult to hold meetings there. After Congress's crushing defeat in Karnataka assembly elections, a senior member of his own party in the state lashed out at Siddaramaiah alleging that his arrogance, his complete authority in the selection of candidates and the Lingayat issue cost the party. The results on May 15 delivered a hung assembly with the BJP emerging as the single largest party with 104 seats, but short of a majority by eight seats. The Congress, which won 78 seats, struck a post-poll deal and extended its unconditional support to the Janata Dal (Secular) which won 38 seats to form and head the government.